Of all the countries of the former Soviet Union, Belarus still retains the most Soviet atmosphere about it. There is an air of secrets and mystery. Statues of Lenin still grace open squares, and old Soviet slogans can still be seen on the tops of buildings. But while the autocratic government in power still suppresses some freedoms, the West has made its impact felt. You would have no problem buying a Big Mac or a Coca Cola in downtown Minsk, and in at least one place, an old Soviet era mural graces the roof of what is now a fashion shop center. This unique atmosphere of half-freedoms and cultural clashes, in the last 10 years, has become a breeding ground of creativity for artists and musicians struggling to express themselves. Out of Minsk comes Drum Ecstasy, a fierce and fiery combination of wild percussion and freaky effects. Featuring three drummers and one bassist, the band fuses a kind of future primitivism with social restlessness into a driving, improvisational sound full of kinetic energy. I got the chance to meet up with the band on a recent trip into Eastern Europe, where we shared some bottles of Belarusian champagne around an old wooden table in a courtyard outside of bassist Philipp Tchmyr's flat in downtown Minsk. The band members spoke mostly Russian, so I had to have a bilingual friend translate for me, but we had a chance to talk about how the band got started, where it's been, and a few interesting moments in their career. Phil gave me a copy of their new CD-ROM to listen to as well. Formed in 1993, the group had their origins in a collective of artists, photographers, and musicians known as Byelorusskiy Klimat, or Belarusian Climate. The original idea was to produce music they referred to, with a sense of humour, as "white voodoo disco". 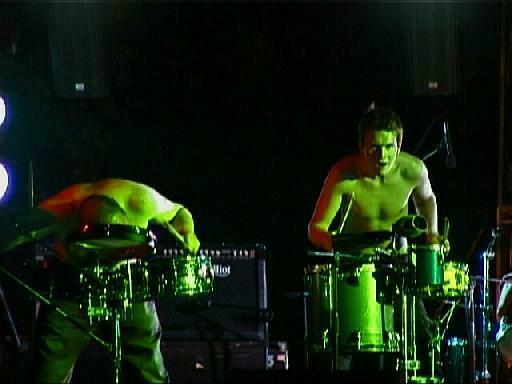 Formed primarily as a live performance group, Drum Ecstasy have not had the opportunity to play in their own country as much as the rest of Europe. With the Belarusian government's clampdown on clubs and venues where rock music can be played, the opportunities are few and far between to play for people in their own country. Every year, however, on November 28, beneath a prominent bridge in downtown Minsk, they play an illegal concert. It began a few years ago, almost by accident. They had not really been intending to actually do it, but when they heard people were showing up, they gave their audience the show they wanted. It has become a tradition for the band; one of the few opportunities they have to play for a Belarusian audience... that is until the police come along to break up the show. They did have an extraordinary opportunity three years ago, however, to perform live with the Belarusian gymnastics team. It was sort of performance art mixed with sports, and they claim they are the first band ever to perform live with a gymnastics team. 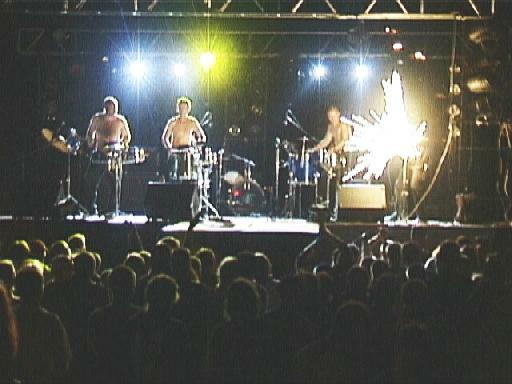 Drum Ecstasy hits the road quite frequently, playing all over Europe, including the UK, with the core of the group, and sometimes up to as many as seven extra drummers. 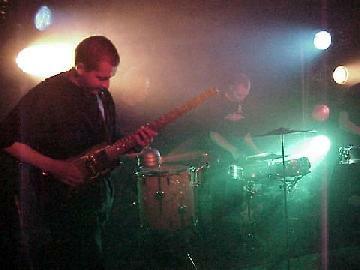 Their live shows fuse pure energy with musical abstraction. They draw largely on their own material, and the occasional recognisable riff from other songs that they have adapted to their own style, sort of mutant cover songs, to give the audience something familiar. They admit, however, that they have opened for more than a couple of bands that they would consider polar opposites to their own music; European pop acts that they have nothing in common with. But, they reason, if only one person in that audience walks away with a new perspective on music, then maybe it's worth it. While they consider themselves primarily a live band, they have released a promotional CD-ROM chock-full of goodies, including pictures, videos, and almost 80-minutes worth of live and studio recordings in MP3 format. The songs range from the purely percussive energy of tracks like Live in Baccarei and Oh Empire! '96 to the bristling, industrial tinged rock of New One and P.R.D., to the spaced out chill of About Elena Kasko's Strange Love to Irish Guys. While most of it is instrumental, the band has experimented with a few vocal tracks, three of which are included on the disc. The vocals have a trancy, chant-like shamanic feel to them, in keeping with the tribal power of the drums, although one track, the haunting Jangaly is pure droning bliss. Certainly one of the standout tracks is the epic, 15-minute collaboration with Traktech Attack, in which a mesmerising industrial ambience swirls around, dark, intense percussive poly-rhythms. The energised spirit of the performances, both live and studio is exhilarating. Drummers Alexandr Kravtsov, Andrey Tchugunov, Alexandr Gorokh work together to both control the rhythms and to unleash wild storms of percussive frenzy. Philipp Tchmyr is one of the most creative bassists playing today, wrenching sounds from his instrument that range from the throbbingly rhythmic, to screeching howls, to spaced-out drones. And if the recordings don't quite give you an idea of what they are like live, there are also some excellent videos on the disc that do, including one of their illegal concerts under the bridge, an extraordinary document of grass roots celebration of music, dancing, and the desire for freedom of expression, with candles, torches, and bonfires to stave off the cold chill of the November night. Also included is a powerful and political video for Oh! Empire, a live performance from a concert in Milan, another live performance documented in 1996, and a promotional video with various clips. For fans who have already experienced the band live, this is a great collection of multimedia stuff to groove to, and for those who haven't discovered Drum Ecstasy, short of catching them live somewhere in Europe, it's a great way to check them out. While they don't have a formal method of mail order for the CD-ROM set up, you can contact the band through their web site and they said they will definitely work out some arrangement with whoever is interested in purchasing a copy. 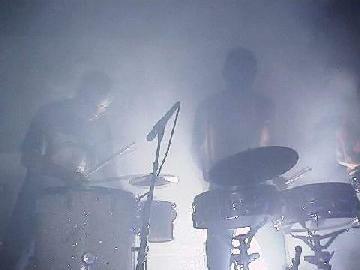 The Drum Ecstasy web site is at: http://www.drumecstasy.com.